Do you like your asparagus fat or thin? Well-done or rare? 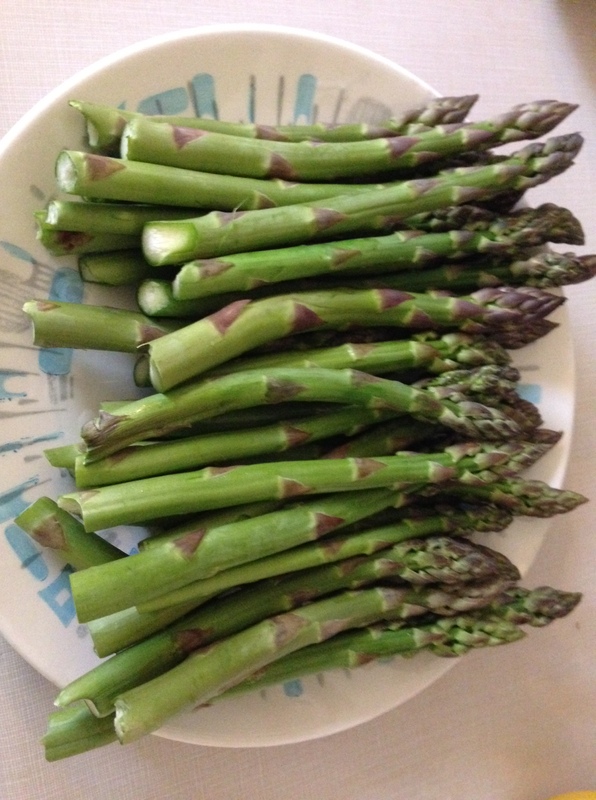 Lovely fresh – and fat – asparagus from Willow Creek Farms, enjoyed at the Manse this evening. Do you like your asparagus fat or thin? Raymond and I have been having more fun than anything these past couple of days, as our old friend and former colleague Lynn has been visiting us here at the Manse. (I’ve shared stories about Lynn before; here is the lovely story she told me about the house she grew up in; and here is one about her gift of Kitty the Lion, who now holds court on the front porch of the Manse.) Back in our Montreal Gazette days together, Lynn (best photo editor ever) and I managed to keep each other in stitches much of the time, even as we worked closely to drum up the best news stories and photos we possibly could. 2. Asparagus: what tastes better, fat spears or thin spears? Now that, people, is a question. When I was a kid growing up here at the Manse, and we had an asparagus bush on the south side of our yard, we tended to like the fat ones, thoroughly cooked so as to bring out all the sweetness. In my young-adult years, not long after the introduction of the dreaded nouvelle cuisine, I suffered through (and pretended to like) trendy undercooked thin asparagus spears, which to me tasted bitter at best and like nothing at worst, and were unpleasantly crunchy to boot. Apparently some people (i.e. Raymond and Lynn right here at the Manse tonight) still have a fondness for the thin and crunchy ones, because when I brought home two gorgeous freshly picked bunches of asparagus from Willow Creek Farms in the hamlet of Wallbridge (which is near my workplace), I was mercilessly mocked for the fatness of said spears. Willow Creek’s farm stand offers thin spears and thick ones, but as I told the very pleasant proprietors, since I was buying I figured I’d get what I like. Raymond can get his own thin asparagus! But such mocking I got! My lovely fat asparagus spears were compared to bamboo sticks and cabers to be tossed, and there were recurring jokes about how many hours it would take to cook them. “I’ve got a train to catch tomorrow!” said Lynn. But you know what? The asparagus was delicious. I just dare Raymond to do better when he picks up some of those scrawny ones. Meanwhile, readers, which do you prefer? Did you, like me, grow up in the era when vegetables were cooked almost to death? And do you, like me, harbour a secret fondness for some – not all, I must emphasize; overcooked green beans are pretty awful – vegetables still cooked that way? Have you, like me, overcome the propaganda about how undercooked veg taste better? Come on out and tell! This entry was posted in Food at the Manse and tagged asparagus, Boston, Bruins, Canadiens, Lowell, Lynn, Montreal Gazette, Raymond, Willow Creek Farms by Katherine Sedgwick. Bookmark the permalink. For me, the “preference” was whatever was available at Kincaid’s IGA, and that was, more likely than not, the fatter type. I’ve noticed the thinner ones don’t seem to have as much flavour. As a matter of fact, I haven’t enjoyed asparagus the last few times I’ve had it and, come to think of it, it was the thin type. Hmmmm. I remember last year thinking that the taste just wasn’t as good as what I was used to from Kincaid’s, so I guess the fatter variety left an impression. Nouvelle cuisine? Yes, with things arranged fan-shaped on plates … three green beans and a couple of dots of sauce. Pay a fortune and leave the restaurant hungry — yep, nouvelle cuisine. Thank God the fad has passed! As for the barely cooked, still crunchy veggie phase, I don’t miss it. 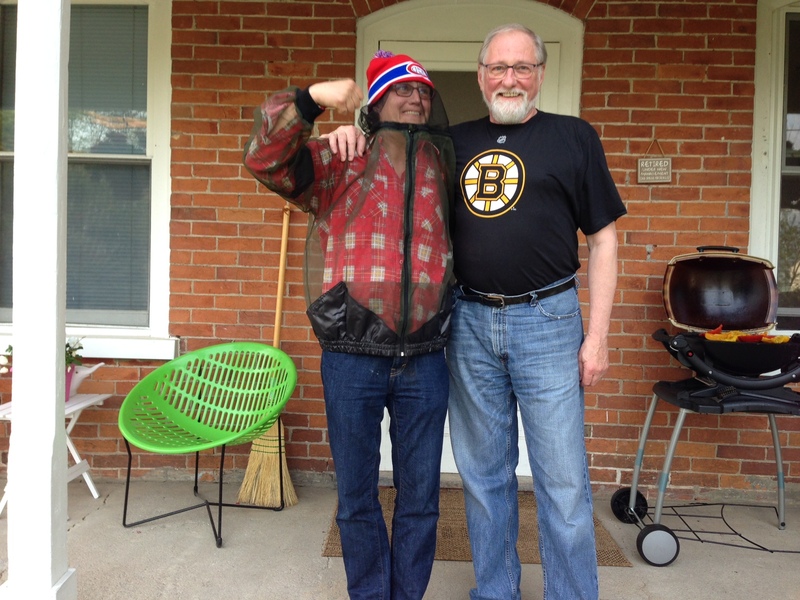 Well, you’ve answered one question for us–we were wondering last night whether Raymond cheers for Montreal or Boston. (You don’t have to ask about the three hockey fans in our house.) As for asparagus, I’m totally with you on fat ones. We’ve taken to roasting or, even better, grilling them–Jonah’s area of expertise now. Oh, an expert griller in the family – you are lucky! I’d say medium, not too well done but not crunchy, though in fact I’ve discovered they can even be quite nice raw. Best with lemon juice and lashings of butter, of course, if cooked. I have a friend who buys the medium ones and uses a carrot peeler to remove a thin layer on the bottom third or so of each. I never thought this was necessary (still don’t) but it gives a gradation of greens that looks absolutely luscious after they are cooked. Oh my gracious, that sounds good, Brian. Will have to try that on the ol’ barbecue sometime very soon. Like (given the appearance of fresh local asparagus) this very weekend!